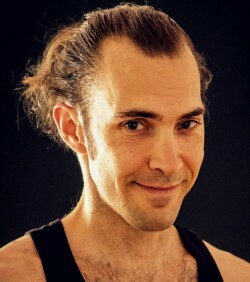 Teacher of Mogadao Qigong, Sacred Taoist Sexuality teacher, Yoga instructor, Tantra practitioner and co- creator of Qi Dance! In his own life and as a teacher Atithi is profoundly committed to growth through self observation, acceptance and integration. After studying qigong and yoga for many years in the U.S he began a journey through Europe, Northern Africa, India, Nepal and Thailand to deepen and refine his experience of these modalities and to seek new therapies such as massage, meditation and dance that became essential components of Spirit Dome Qigong. During his journey two powerful experiences involving meditation and community took place which fundamentally shifted his perception and prompted him to refocus his life purpose. At the end of one of these experiences he came in contact with Kalpita and realized that they were meant to walk their path toward wholeness together. They have completed the Soul Mate training for couples with Ma Ananda Sarita of Osho’s Tantra lineage. Atithi believes and teaches that self-observation and a disciplined sacred physical practice is a path toward transformation, authenticity and to self- mastery. Atithi and Kalpita have been teaching together for many years. To the great benefit of their students they have utilized each other as mirrors, working tirelessly to evolve their techniques as teachers separately and as a couple. Their complimentary differences as individuals combined with their experience as teachers and as a couple on the path of Sacred Sexuality has proven to be a dynamic and sensitive force. They believe that a safe and sacred environment is the basis for personal transformation and spiritual evolution.